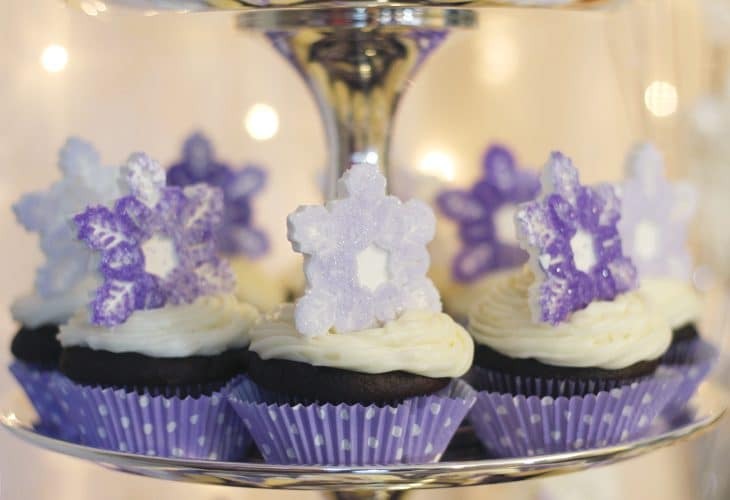 Learn how to make these easy, DIY chocolate snowflake cupcake toppers. Perfect for your next winter party! You know when you’re super excited about a project and you’re ready to show everyone and then you realize half of it is missing or destroyed….well ya that just happened. I took step-by-step photos on how to make these gorgeous chocolate snowflake cupcake toppers but I guess the sprinkle fairy’s decided we didn’t need them because they are just too easy. Or maybe I deleted them off my camera before downloading them. 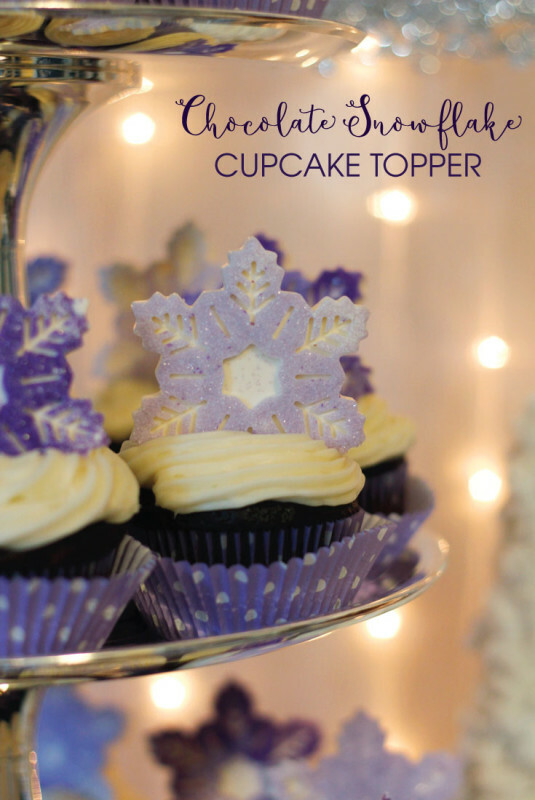 Either way, today I’m excited to tell you these simple instructions on how you can make your very own chocolate snowflake cupcake toppers. 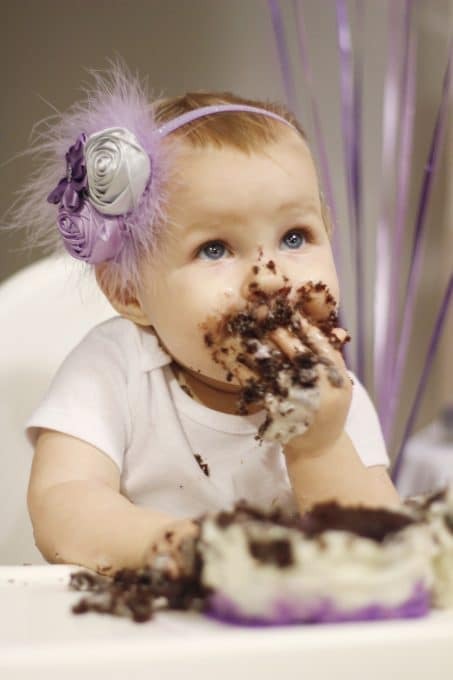 When I was planning Clara’s first birthday party, and we decided to go with a hot chocolate bar theme, I knew we would also need some sort of yummy dessert, because what birthday party isn’t complete with out some sugar? Rather than having to figure out cutting and serving a cake to our guests, I decided we would go down the cupcake route. 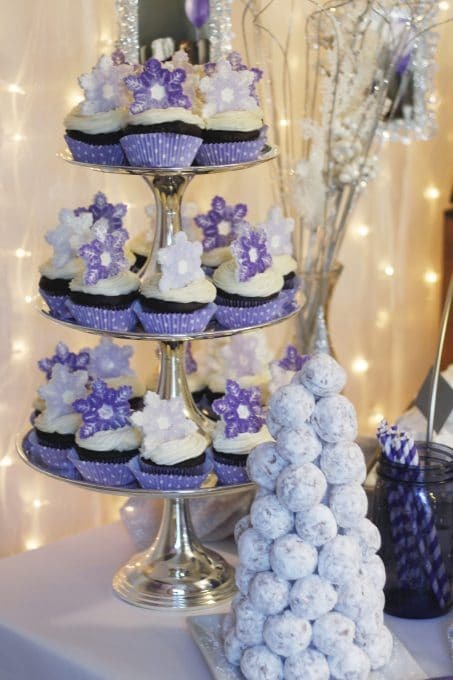 I bought these Wilton Purple Dots Baking Cups that went perfectly with our winter wonderland purple and glitter theme. To make it simple, we used a Pillsbury Super Moist cake mix and added in about two cups of chocolate chips to make them taste homemade. Yum! So easy and I didn’t hear one person complain about using a boxed cake mix. We used three boxes and had enough to make 40 cupcakes, plus two small circle cakes to make Clara’s smash cake. And because everyone needs cute baby pictures, I’ll just leave this right here. She loved her birthday cake!! Next week I hope to share with you how to make an awesome smash cake for the little children in your life. The chocolate snowflake cupcake toppers are super simple to make and can be done a week in advance. All you need is melting chocolate, sprinkles of your choice, and a silicone snowflake mold. 1. Buy this silicone snowflake mold from Amazon. This thing is seriously awesome!! 2. Start by putting a layer of sanding sugar in the bottom of the mold. Add enough to fill the first layer of grooves but don’t go higher so that you will be able to see the white chocolate show through the snowflake holes. I used sanding sugar in two different shades of purple: lilac and lavender. You can buy the exact same type of sugar I used here. I think the sanding sugar is key for these cupcake toppers. I tested four different types of sprinkles and the sanding sugar sprinkle definitely turned out the best. 3. Put a few handfuls of melting chocolate in a microwave safe bowl. Heat the chocolate in the microwave in 30 second intervals stirring in between time until your chocolate is smooth. It took about 1:30 for each round to get the chocolate melted all the way. Be sure to not overheat your chocolate! If anything, stop when you can see a few clumps still in your chocolate bowl and stir the mixture until it’s all melted down. 4. Once your chocolate is smooth, use a spoon or cookie scoop to put the chocolate in each mold. Fill it just enough to cover the bottom of the mold. Take the back of a spoon and push the chocolate to make sure all the snowflake tips are filled. 5. Once all the snowflake shapes are filled, keep your mold flat and put your mold into the fridge. Let it cool for at least an hour in the refrigerator. 6. After your chocolate is hardened, take your mold out of the fridge and flipping the mold inside out you’ll be able to peel out your snowflakes and they’re ready to be placed on your cupcake! 7. 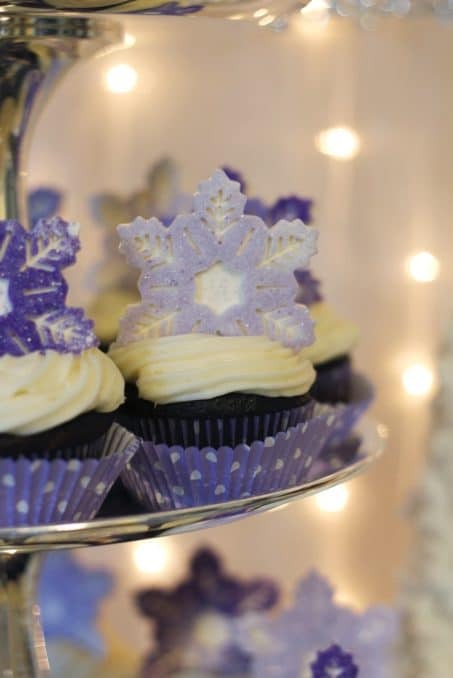 Once party time comes, frost your cupcakes and then push the edge of your chocolate snowflake cupcake topper into your cupcake at a slight angle. Be sure to push it a little bit into the actual cake to hold it upright. These safely store in an airtight container for at least a week but I’m sure they would last longer if you needed to. I only had one mold with 6 snowflakes so made chocolate snowflake cupcake toppers throughout the week before the party. I love how they turned out and helped bring in the wintery feel while also adding in some more purple to our hot chocolate bar party! Besides, they tasted yummy and looked cute too! In case you missed it, be sure to check out the donut hole tree that sat on our party table by the cupcakes. They looked so cute next to each other to help celebrate our little one-year-old. If you love these snowflake cupcake toppers as much as I do, I’d love for you to share them with all your friends. You are so, so cool!! How beautiful!